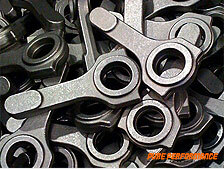 PPM connecting rods are formed from 4340 alloy steel bar. 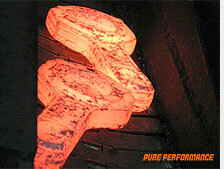 Cut into lengths, they are conveyed to an induction heater and in seconds their temperature escalates to around 2,275F. After the hammer process, the forging is removed by conveyor belt to the hot trimmer where the flashing (the ledge of excess steel around the forging) is removed. The flashing is recycled. One of the final operations at the forging house entails placing the connecting rods on a micro-alloy cooling conveyor that controls their hardness and mechanical properties. This flat is also used for temporary identification marks, specifically for reuniting the rod and its cap after the parting tool makes its cut. The next operation is to bore the small end of the connecting rod, which acts as a reliable locator for sculpting the outer profile of the cap and later for boring the big end. Centered on the small-end bore, the forgings are fastened to a tombstone where the outer profiles of the con rod caps are machined. 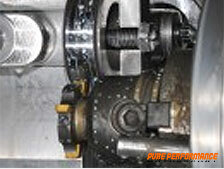 For strength PPM favours twin ribs between the bolt centers rather than a single rib. 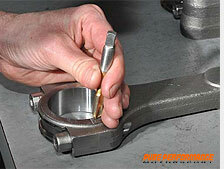 Note the gold-colored, carbide-tipped slotting tool used to create the twin ribs. 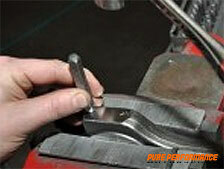 A rounding tool contributes the finishing touches. 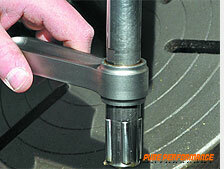 The parting tool with carbide-tipped blades is about to separate the rod beam from its cap. 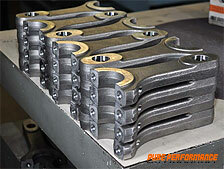 Three engine sets of PPM connecting rods await caps to be fastened. The next step is to machine the outside profile of the beam to size and complete the recessing operation with a ball-nose end mill, giving the I-beam or H-Beam rod its configuration. 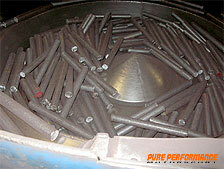 Carbide cutting tools are renewed after machining 96 rods. 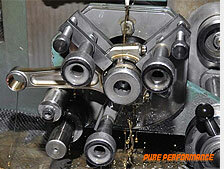 "Cheeking" is the term used to center the little end in the piston, which is achieved by machining an offset on the big end. To accommodate the offset a large chamfer is also machined on the big end, which is always adjacent to the radius of the journal. The piston pin housing is bored, honed with a cross-hatch pattern and press-fitted with an Ampco 45 aluminum nickel bronze alloy bushing. The bushing, which is initially longer than the finished size, has a .001-inch interference fit and is press-fitted into place with a 10-ton press. 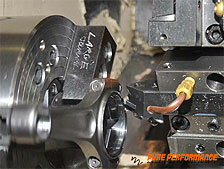 After burnishing, the bushing grows around the edges; hence, it is trimmed to size and chamfered. In a malleable, plastic condition, not a molten state, the material is handled by tongs and placed in each of three con rod impressions carved into a die block. As the hammer man runs the hammer, he displaces the soft, white hot metal into each impression, gradually forming the connecting rod. 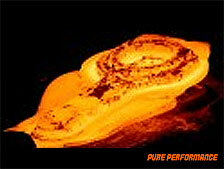 The hammer, which imposes a force of 3,000 pounds, impacts the material one strike per second. Three strikes of the hammer and the con rod is forged. 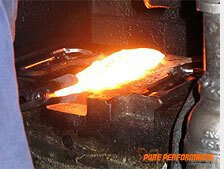 The next stage is called piercing, where material is removed from the center of the forging. The first machining operations include face milling the big and small ends and machining a flat on one side of the big end that acts as a locator for subsequent machining operations. Using 4340 alloy steel forgings, PPM requires a consistent hardness throughout the connecting rod and calls for a reading of 36 to 42 on the Rockwell C-scale. 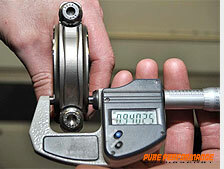 Testing the hardness involves pressing a steel or diamond penetrator against the surface of the connecting rod and measuring the resulting indentation. 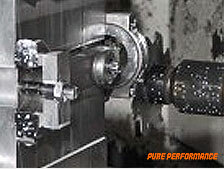 Deburring, blending, polishing and shot blasting are all crucial operations in the making of a competition connecting rod. 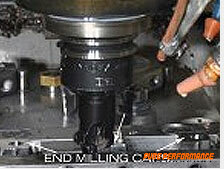 Here, the small end, bored to .986-inch, is being deburred. Bolt holes are bored 3/8- or 7/16-inch. The lighter, track-tested 3/8-inch option is favoured by many of today's racers. 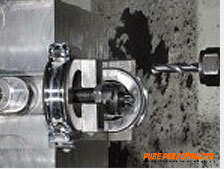 Because of potential deflection in the carbide drill bit, PPM drills the bolt holes on the beam separately from the caps. 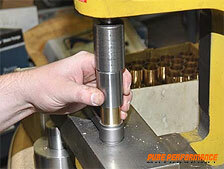 After the caps are end milled, they are drilled, bored and chamfered for the locators. The machinist then interpolates and rough cuts the bore of the big end, already clamped in place behind the cutting head. Observing the age old convention, indenting (dotting) the beam and cap confirms correct alignment of both parts. 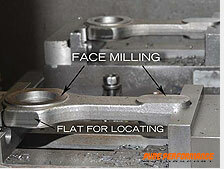 The earlier set of identification marks (on the bolt boss) have vanished during the machining processes. 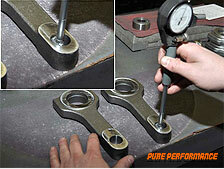 With a dial gauge micrometer measuring to the fifth decimal place, PPM measures rod width. 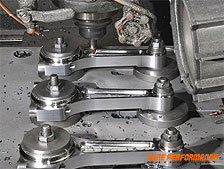 Rod width is designed to allow two rods to be placed on a crankshaft journal, and when each rod is moved toward its journal radius, a clearance of .016-.018-inch exists between them (measured by a feeler gauge). This is called side clearance; more side clearance is preferable to less. 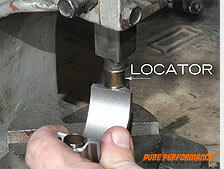 Roller burnishing with taper rollers squeezes the aluminum nickel bronze bushing in the small end of the rod into its bore by almost .001-inch, thus preventing the bushing from rotating under severe conditions like heat and pressure. When honing the big end, the outer diameter of the bearings must be slightly larger than the bore of the con rod's big end. 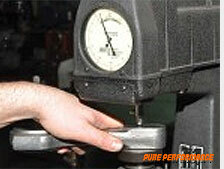 This slight but critical difference between the two is known as bearing crush. Without bearing crush the bearings would spin in the bore. 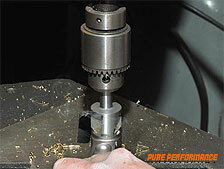 A crank pin journal of 2.100 inches requires a housing bore of 2.225 inches to accommodate the thickness of the bearings and to provide sufficient bearing-to-journal oil film clearance. Finally, each rod is checked for center-to-center accuracy before dispatch.